Okay Folks, lots happening on the Plugd front over the next few weeks so heres the lowdown. First up, Starting this Saturday is our usual post Christmas sale, with 25% off everything (except new releases) for the next two weeks. The next bit of news concerns what’s happening after that two week period! As a lot of you may know the move to Caroline Street was always a temporary arrangement. The space has worked out really well and was great to get back into the swing of things with the shop. Our new premises are now ready and we shall be opening there on Saturday 12th of February. The shop will now be located on the first floor of the newly refurbished Triskel Arts Centre, Tobin Street. For those unfamiliar with the geography of the metropolis that is Cork, thats the site of the Triskels original incarnation. 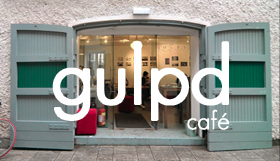 In addition to the shop, we are also opening Gulpd café on the 12th. The café will offer a dynamic menu of food and drinks, will be open 10 to 6 Tuesday to Saturday and will remain open late in conjunction with Triskel evening events. To facilitate the move we are closing at Caroline Street on Saturday 5th, with the next week spent hauling records, cds, shelves etc back to the more familiar end of town to get open on time! To aid in getting over all this stress we are having a get together at our new home on the evening of Saturday the 12th. In the Auditorium, from New Zealand, we have psychadelic noise project ‘Our Love Will Destroy The World’. Campbell Kneale’s one-man show that veers between austere electronics to ferocious noise. On support we have First Blood Part II. In the café we will have our favourite record choosers and adopted Dutchmen, Juju & Jordash. Expect anything from Thelonious Monk to Cabaret Voltaire and no doubt some of their own productions. Support will be from Tokishiko and an array of associated vinyl fondlers. Check out their radio spot on deepfrequency radio, big fans. So please come join us in celebrating a pretty exciting move and a new start (again!) for Plugd v.2.5!, food, drink and the distinct possiblilty of dancing. Juju and Jordash from 9/9.30 p.m with Tokishiko and friends playing some records all the way from the early evening.